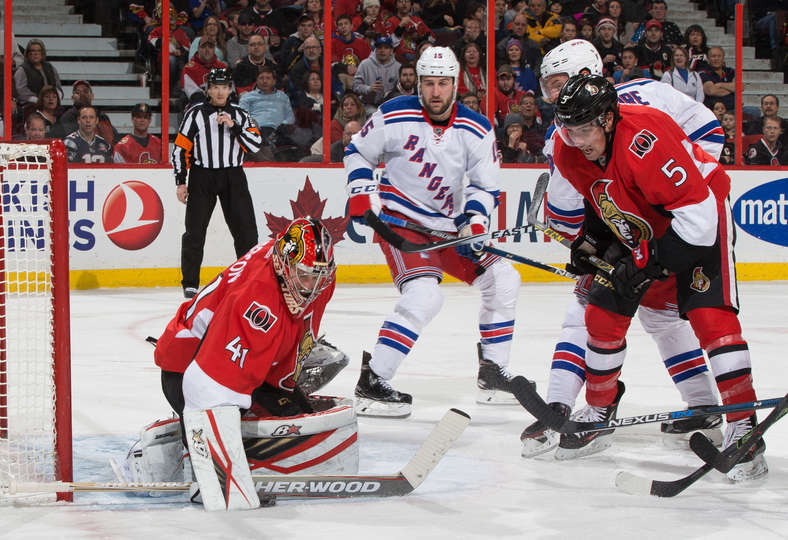 OTTAWA – Mike Hoffman had a goal and an assist and Craig Anderson made 35 saves to help the Ottawa Senators to a 3-0 win against the New York Rangers at Canadian Tire Centre on Sunday. Hoffman helped set up Bobby Ryan to open the scoring with 20 seconds left in the second period and scored his team-leading 22nd goal at 2:40 of the third period when the Senators (23-20-6) ended a two-game losing streak. Jean-Gabriel Pageau scored a short-handed goal into the empty net at 17:38 of the third period. It was the Senators NHL-leading 10th short-handed goal of the season and Pageau’s League-leading fifth. The win was the Senators’ fifth in their past 13 games (5-8-0). Goaltender Henrik Lundqvist made 30 saves for the Rangers (26-17-5), who had their two-game winning streak ended. They were shut out for the fourth time this season. Ryan, who scored his second game-winning goal of the season, had been critical of the Senators’ play after a 5-2 loss against the New York Islanders on Friday, and said he felt like he backed up his comments. “I think so. When you put yourself out there and you make the comments, they’re going to echo throughout the room,” he said. “Who am I to say it and ask these young guys to do it, if I’m not doing it? It felt like I did what I said I was going to do, and everybody followed along. It started with (captain Erik Karlsson) tonight. He made some big plays defensively, we know what he can do offensively, but the way he did things defensively, everybody buys in when you see a guy like that doing it. Inconsistency has been an issue for the Senators this season. Hoffman said the win was one of the Senators best games of the season. The challenge is to do it again Tuesday when the Senators play the Buffalo Sabres at Canadian Tire Centre, their last game before the All-Star break. The Senators will try to win two games in a row for the second time since Dec. 3-5. Anderson, who got his third of the season and the 32nd of his career, agreed. “There’s lots of time to rest after Tuesday, so there’s no excuses for any type of lull in our performance Tuesday,” he said. “We should come out with the same intensity, knowing we’re going to have time to rest. I like our odds if we’re playing with the same intensity. The first period was scoreless, but the Senators had a wide edge in play with 30 shot attempts. It was a poor start for the Rangers, who had won two games in a row for the first time since Nov 21-23. Rangers coach Alain Vigneault expressed his frustration with his team’s inability to string wins together in a short postgame press conference. “Every time we think we’re building a little bit of momentum, we come up with one of these tonight,” Vigneault said. “I mean, other than (Lundqvist) and (forward Jesper Fast) we had so many guys who were off their game. It was unbelievable. We were on the outside the whole night and just didn’t have a good game at all. Ryan opened the scoring at 19:40 of the second period when he finished off an odd man break by battling in the New York crease for a loose puck to make it 1-0. Ryan carried the puck into the Rangers zone and deep into the corner to the right of Lundqvist. He passed it back to Hoffman in the circle who relayed it to defenseman Jared Cowen at the left point. Cowen’s hard shot went off the right post and Ryan outworked Rangers defenseman Kevin Klein to knock in the loose puck in the Rangers crease. With Anderson out of position early in the second period, Rangers forward Kevin Hayes was alone at the edge of the crease and fanned on a chance to put the puck in the empty net. That wound up being the Rangers best scoring chance of the game. The Rangers play the Buffalo Sabres at home Monday in their final game before the break.